1. Line 2 baking sheets with baking paper or greaseproof paper (grease it first). 2. Combine flour, coconut milk powder, yeast, sugar and salt in a large mixing bowl. 3. Rub in the butter so the mixture resembles bread crumbs. 4. Make a well in the centre of the bowl and slowly add the water (don’t add all of it - add about 200 ml and then mix together until it forms a dough – keep adding a little bit of the water until the dough is not too dry or too sticky). 5. Knead the dough until it feels soft for approximately 3 or 4 mins. 6. 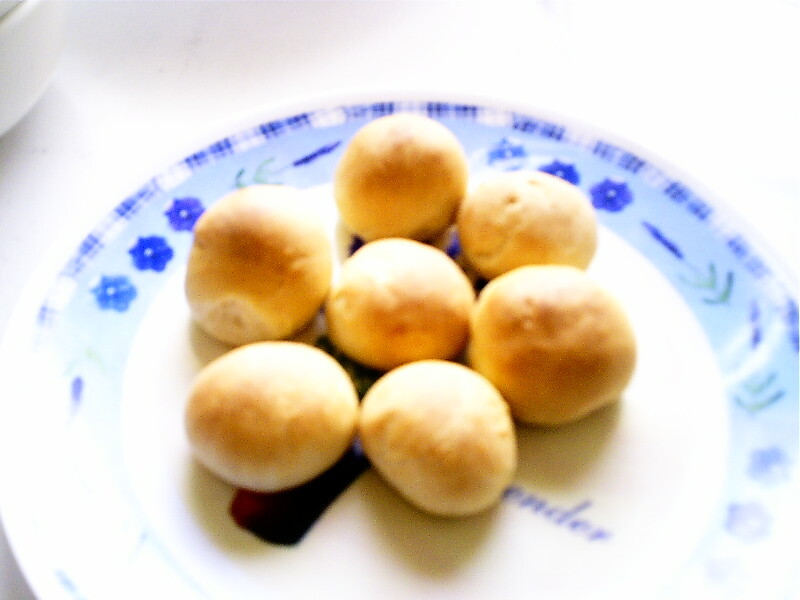 Break off a piece of the dough, roll it until it forms a small ball, and place on the baking sheet. Keep going until all the dough is used up. 7. Cover the bread rolls with cling film that has been oiled and leave to rise for about 1 hour. 8. Bake in an oven at 200 C / gas mark 6 for about 12 – 15 mins. 9. Serve warm with butter. Would go lovely witha cup of tea & for sharing.